MOSCOW, March 25. /ITAR-TASS/. An initiative of a group of Ukrainian deputies to withdraw from the Nuclear Non-Proliferation Treaty means that the treaty is under threat, the Russian Foreign Ministry said on Tuesday, commenting on a statement made by the Russian delegation at the Nuclear Security Summit in The Hague. 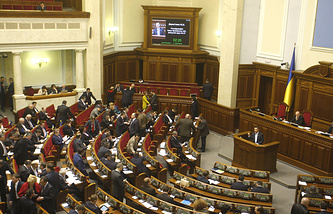 “Regrettably, we have to note that deputies from Ukraine’s Batkivshchyna and UDAR ruling coalition parties have put forward a legislative initiative on Ukraine’s withdrawal from the Nuclear Non-Proliferation Treaty,” the Russian Foreign Ministry said, adding Russia did not trust a Ukrainian representative who tried to dissociate himself from the proposal. “A serious threat is looming over the Nuclear Non-Proliferation Treaty. It’s a pity that other depositories of the aforesaid treaty are pretending not to notice this threat,” the Russian Foreign Ministry stressed.